I have a client who spends his time sailing from one Caribbean Island to another. What a nice life, hmm? This very nice "gentleman sailor" contacts me from time to time for a new shirt or two. 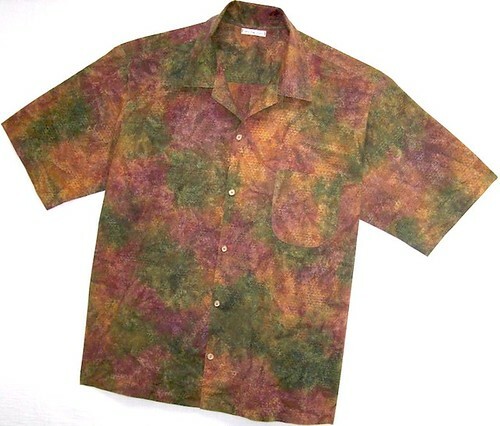 His recent request was for a casual shirt in "some sort of dark tone print." How lucky for both of us that I had the perfect cotton batik among my shirt fabrics! This shirt is of my own design, that I call "The Bermuda Shirt". It is a classic "camp shirt" silhouette, with some very subtle shaping of the side seams and a collar that curves, rather than laying flat against the shoulder. The side shaping avoids an overly baggy look, while still providing a loose comfortable fit. "Pool Boy? I'd like a margarita, please....and don't forget the little umbrella ! " (I ordered the Barcelona Pattern after seeing yours :) Very anxious to receive it. Oooo, I love that fabric. That shirt is perfect for hanging out at Karel's bar in Bonaire or at Marigot Bay. Mmmmm, I miss the Caribbean! As usual, a beautifully made shirt. I love that you are adding what you interfaced with, especially since I have all your interfacings. it's those little adjustments that make a shirt perfect. Nice shirt--for sailing, or drinking! Love the fabric. Perfect for the wearer and activities! The fabric is fantastic! Side seam shaping for a casual shirt is a nice touch.